I purchased Bella Notte as an adult novel, but after reading it, I think it is really targeted at the young adult or teenage market, and I will review it within that framework. Emma is the novel's protagonist, a high-school senior, fond of black clothes and monster movies. Somewhat of a loner, she is not part of the in-crowd. So when the new boy, Mike, shows an interest in her, she gravitates toward him, especially when she realizes that she has been dreaming of him since she was three. A budding romance develops but is interrupted by the re-appearance of her childhood friend, Dom. While all this is happening, there are constant references to the "change," and "our kind." Neither Emma nor Mike can understand just what this means. Their families don't seem to approve of each other, and while initially Emma is antagonistic towards Dom, her feelings begin to shift as she approaches her change. Written in a sparse, direct style, the storyline moves fairly quickly, encompassing many different settings and actions, from a nightclub in Rome to high school classes to a fashion shoot in New York. It certainly checks off several different scenes which should interest the young and primarily female reader. The book falls short in several areas, though. Dialogue is often stilted. Contractions are too sparsely used to reflect real speech. Settings are not very well fleshed out. Even after reading the book, I can't picture the school, the home, the "castle" in Italy, and various other settings. I may be wrong, but I don't think the author has been to Italy as several things were just wrong, not the least that Italians do not celebrate American Thanksgiving. I also had a problem with Emma as a protagonist. Introduced as a brash, perhaps feisty loner, she turns out to be afraid of pretty much everything, from airplanes to boats to frittatas (well, almost every character is afraid of airplanes in this tale.) She is quite timid. And the transformation in her feelings for Dom was not believable. It also takes 2/3's of the book for both Mike and her to understand just who they are, despite every single hint and foretelling being thrown at them. There is absolutely no suspense in it, only frustration at their combined obtuseness. Emma's transformation from invisible high school student to prom queen is also not really explained. By the time of the prom, the transformation had already been completed. But prior to that, when she is suddenly picked as homecoming queen, I think it was, there had been no explanation on how this odd loner could suddenly be popular. Not much is explained about werewolves, but the author does take time to explain her version of just what a vampire is, and her fascination with vampires is obvious. She has well and truly thought out the "science" of being a vampire, and how they might interact within society. Some of her historical perspectives were pretty enjoyable and imaginative. I am not writing this as fact as I am neither qualified nor do I know the author, but I got the feeling that she threw in many aspects of herself in the book. She is afraid of flying, so Emma is also afraid of flying. She thinks a Jeep Wrangler is a tough street car, so Emma has one. She wants to be a model, so we go to a fashion show. And so on. I apologize if I am wrong, but that is just the impression I received. I read another review which mentioned that if a reader likes the Twilight series, he or she would probably like Bella Notte. I think that is a valid reflection. This is a book of teen angst, love, growing up, and self-discovery. As the book ends with Emma's graduation from high school, it is obvious that there are more volumes of her story forthcoming. And for the young adult market, those stories might be well received. However, for the adult market, I think this book may not be a good choice. 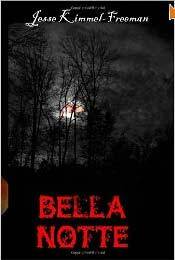 For more reviews or to buy Bella Notte from Amazon.com, click here.